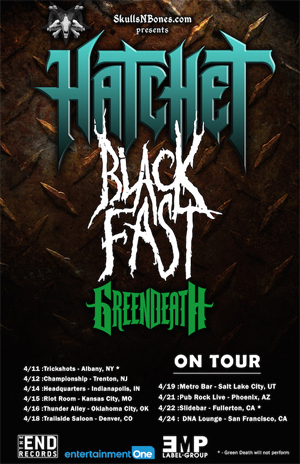 Bay Area natives and thrash metal band HATCHET have just announced April show dates with BLACK FAST and GREEN DEATH, on their return to the West Coast following their tour with metal pioneers METAL CHURCH. The HATCHET/BLACK FAST/GREEN DEATH tour is presented in collaboration with Skulls N Bones. HATCHET fans can expect a set list that heavily focuses on their latest album, Fear Beyond Lunacy. Says HATCHET's founding member, vocalist, and lead guitarist, Julz Ramos: "We are excited to be hitting the road with some new friends in BLACK FAST. While planning a route home from our East Coast METAL CHURCH tour, we were looking for similar band who we thought could also bring their own element to a small package as well as their own growing fan base. BLACK FAST have had a good buzz going for some time and after checking out their music we felt they would be a great addition to have alongside us! We also reached out to GREEN DEATH who we shared the stage with in Des Moines, while on tour with DOYLE late last year. They were one of the few opening bands that made a lasting impression on me of that entire tour. Now I hear that they are to release an album through EMP which is David Ellefson's new label. I was floored when I heard that and thought they would round out the package great! We feel both bands will be able to offer something unique and we are both still growing. We hope to exchange some fans and friends and have a great time along the way. I think this will be a great Intimate club package. Stoked!" Please see below for dates and tickets.